Say you have a handsome lodge or clubhouse with empty walls that are just begging to be decorated, but you feel uncomfortable hanging out with the heads of dead animals. What’s a person to do? 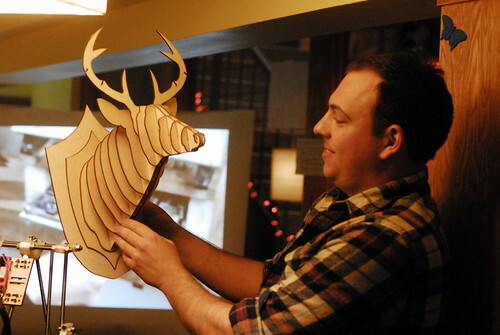 Why, obtain a deer trophy fabricated from of rustic and animal-friendly birch, of course! One of our regulars, Alec Wadzita, put together the design. He’s offering the smaller birch deer trophy (~22x16x17cm) for $100 and the larger birch deer trophy (~26x37x29cm) for $150. If you want to get your hands on one of these beauties, get ahold of Alec at vegantrophies(at)gmail.com.